STUTTGART, Germany (Reuters) -- Porsche confirmed on Monday it got a 700 million euro ($980 million) loan from its Volkswagen unit but insisted it could cope with its debt woes. "Porsche is not on the verge of insolvency even if that is alleged over and over," a company spokesman said, referring to media reports about the German group whose takeover of VW has stalled, forcing it instead to seek a merger with VW. Volkswagen had said over the weekend it loaned the money to its biggest shareholder, adding a bizarre twist to Porsche's aborted effort to take full control of Europe's largest automaker. 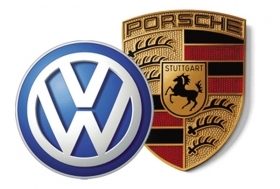 Porsche, which owns a 51 percent voting stake in VW, said the loan matured at the end of September 2009. Laboring under a 9 billion euro load of debt it had accumulated by the end of January, Porsche was forced to abandon a complete takeover of the Wolfsburg-based carmaker. German weekly magazine Der Spiegel reported that the loan was made to help prop up Porsche's finances earlier this year and that Porsche's owners had put up Porsche Holding GmbH as collateral. Porsche Holding is an Austria-based automotive wholesale distribution firm owned by the Porsche and Piech families, who also control Porsche Automobil Holding SE. In March, Porsche Automobil Holding SE was struggling to raise 12.5 billion euros in loans to cover the cost of refinancing debt. Porsche eventually raised 10 billion euros, and in the past week said it had raised a further 750 million euros. The company is still on the lookout for the extra 1.75 billion in loans. After abandoning its takeover plans, Porsche Automobil Holding SE is now seeking a merger with VW. The Porsche spokesman said talks were being held at the executive board level and that no timetable for concluding them had been agreed. The partners had originally aimed to wrap up the talks on creating an integrated automotive group by early June.